Compatible with the FlexiMass™ series of microscope slide-format sample targets, these slides provide researchers with options depending on their experimental workflow. Ready-to-use, these disposable targets eliminate the need for cleaning and the risk of carryover. Alternatively, the reusable stainless steel FlexiMass™-SR sample targets provide a cost-effective, longer-term solution to sample preparation. 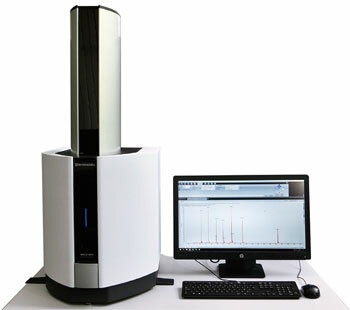 Linear mode instruments have traditionally been the instruments of choice in MALDI-TOF-based quality control (QC) and profiling workflows, and the MALDI-8020 is no exception. 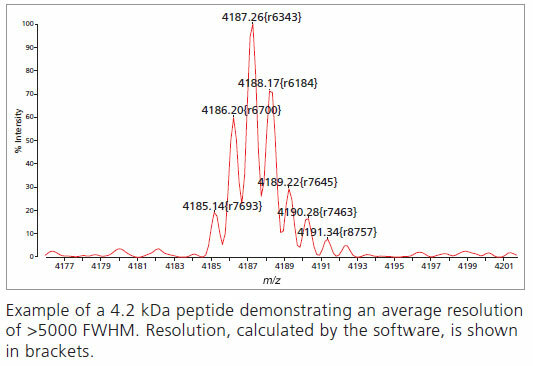 Peptides, proteins, polymers or oligonucle otides - the instrument is capable of delivering the performance required for QC applications. Research laboratories will also benefit from the MS capabilities of the instrument through the rapid mass-measurement of samples. 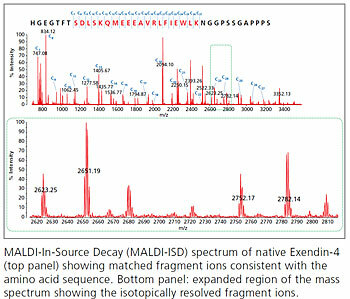 To maintain instrument performance over time, the MALDI-8020 features wide-bore ion optics - a feature used on our existing MALDI-TOF products - which minimize the risk of source contamination over time, providing a robust platform. To maximize uptime, the system is equipped with TrueClean - an automated, rapid (<10 min) UV laser-based source cleaning which can be used to clean the extraction electrode in-situ without breaking instrument vacuum. 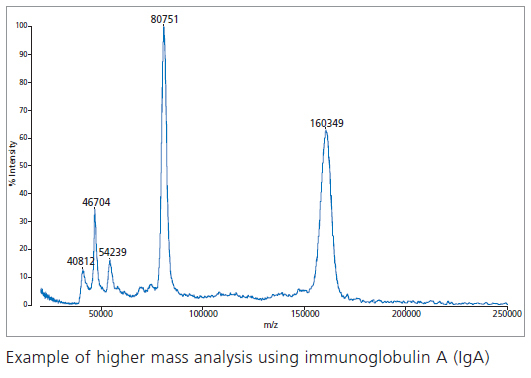 As mass spectrometry moves into clinical laboratories, the MALDI-8020 is the perfect choice for researchers developing MALDI-based diagnostic methods†. The system is designed and manufactured to ISO 9001:2015 and ISO 13485:2016 quality management standards and is CE compliant. Through the selection of components demonstrating improved longevity and performance, and by reducing the number of component parts, our engineers have created a reliable and robust platform capable of delivering outstanding performance in a small footprint. 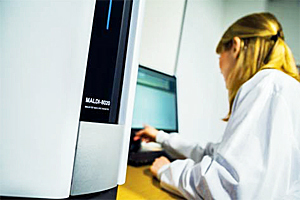 The MALDI systems are maintained by trained service support engineers who form part of the Shimadzu global distribution and support network. Routine maintenance is simplified thanks to the instrument design, providing our engineers with easy access to commonly serviced parts. Inset: expanded view of the highlighted region. 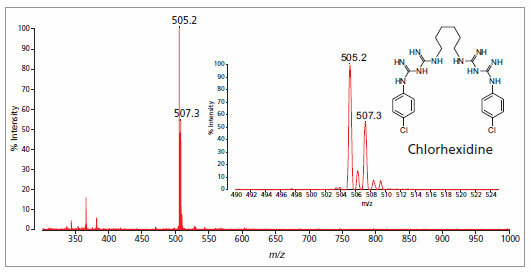 Analysis of chlorhexidine gluconate in mouthwash solution. 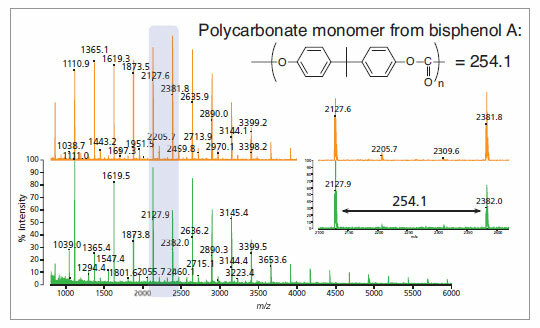 Sample was prepared with MALDI matrix without any clean-up or dilution. Inset: expanded view showing peak at m/z 505.2. Operating under the control of MALDI Solutions™ software, the software features a centralized, secure Microsoft* SQL database which can be used to store everything from sample lists and acquisition Parameter Sets to acquired MALDI data. The system is managed by an Administrator and customizable user profiles provide control over access to the database and operation of the instrument. Along with a full audit trail, the software provides the tools to help achieve 21 CFR part 11 regulatory compliance.